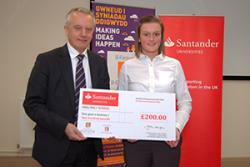 Carley was presentedwith her winning cheque by Professor John G Hughes.Carley Williams a student studying Product Design with Qualified Teacher Status will represent Bangor University in the UK round of the Santander Entrepreneurship Awards, having won Bangor University’s Competition. She will be joined by winning postgraduate student Hernan Diazgranados in the national competition later this year. Both students are through to the final round having successfully ‘pitched’ their business ideas to a panel of judges, including the University’s Vice-Chancellor Professor John G. Hughes, recently. Having been tasked by the B-Enterprising team in the Careers & Employability Service to come up with an innovative business idea, the shortlisted project ideas presented covered a wide range of products and subjects, and included costings and marketing ideas. Following presentations by the shortlisted applicants, the judges awarded top prizes of £200 each to the best undergraduate and postgraduate students. In announcing Carley Williams as undergraduate winner, Vice-Chancellor Professor John G. Hughes said that the judges had been impressed by the fantastic amount of work that she had done, which was indicative of the standard of work by the students on the University’s product design course in general. Carley Williams’ idea stood out as the most outstanding however, and it had fantastic market potential. Carley Williams, who comes from Builth Wells and is 20, designed a protector for use by children who have a ‘peg’ or feeding (percutaneous endoscopic gastronomy) tube inserted into their stomachs. Carley’s device prevents young children from removing their ‘peg’ and is a great solution to a current problem. Carley was surprised at her success and will now consider how to develop her project further and consider which course to take; either developing her product further or pursuing a career in teaching. Having received his cheque, Hernan was congratulated by the Judging Panel.The judges considered Hernan Diazgranados’ idea a well-presented, exciting and viable project. Hernan, who comes from Barranquilla, Colombia, has already invested in commercial development of his music-streaming application for the mobile environment, which provides some additional unique features. Hernan, has had an idea to develop a music-based ‘app’ for a while, but says the current idea came to him in a ‘bolt of inspiration’. He is at Bangor University studying an MSc degree in International Media Management, is confident in the success of his business idea, and is keen to source more funding and partners to develop the project further. He won a Scholarship to study at Bangor, and during his time here has been involved in another entrepreneurship project at the University: Enterprise by Design, a programme which creates teams comprised of students from different disciplines, who share their knowledge to provide a practical solution which addresses a real-life business scenario. Hernan found this to be a very rewarding experience where he learnt a lot about facilitation and team work. All the competitors and judges posed for photos at the end of a fascinating afternoon of 'pitching'.The judging panel comprised Professor John G. Hughes, Vice-Chancellor; Chris Walker, Director of People Systems International and a University entrepreneurship mentor and Diane Roberts of Santander Universities. The Final Round of the Santander Entrepreneurship Competition takes place in Triton Square, London on 1 July 2015. 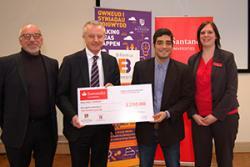 The Bangor University stage of the Santander Entrepreneurial Awards is part-funded by the North-West Wales Regional Hub, which is one of six regional hubs established by the Welsh Government to drive its commitment to encourage youth entrepreneurship in Wales.